Since the first Dread Disease Survey in the mid-1990s, Gen Re has made a continuous effort to help the industry understand the emerging experience and the potential risks associated with this living benefit, also known as Critical Illness, Serious Illness or Trauma Cover. The current sixth survey covers the period 2008-2012 and largely adopts the methods and layout of the previous surveys. A total of 84 companies from seven markets participated this time submitting data on more than 100 million in-force polices as at the end of 2012. About 1.2 million claims were captured during the study period (see Figure 1). Similar to the last survey, traditional products make up the bulk of the business with nearly 96% of policies, while juvenile policies rank second at 2.3% and cancer-only policies third at 1.3%. Female-only polices contribute only 0.6%, while male-only policies are negligible at 0.02%. 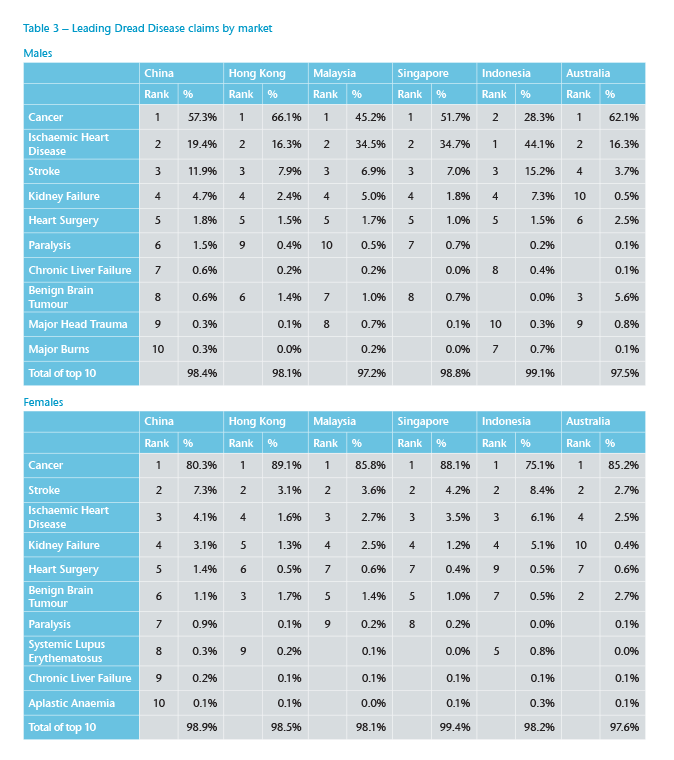 All major market players in China and Singapore participated, with an estimated coverage of 96% and 89% respectively. We estimate the actual coverage in the Hong Kong market amounts to about 95%. Additionally, the survey covers 48% of the individual business in Australia, 42% in Indonesia and 55% in Malaysia. The China market alone reported about 90% of the policies and claims in our survey. Within that market, more than 70% of the share was from the two biggest life insurers; we therefore make a weighted adjustment so that the overall findings are not overwhelmed by the significant exposure and claims from these two companies. For purchase behaviour and claims analysis, only traditional products were included. For claim analysis and actual versus expected ratios, data from the first and second policy year was excluded as this may be affected by selection effects. Figure 2 shows the distribution of in-force policies by age band. In all markets except Malaysia, more than half of the in-force policies are from the age band 30-49. Compared with Asian companies, Australian insurers seldom sell policies to juveniles and young adults. Female adults in Asian markets, except Indonesia, are more willing to purchase a Dread Disease policy than males, perhaps explained by the high numbers of female insurance agents who find it easier to sell to another female. This is reflected by the higher female-to-male ratio observed in our survey portfolio compared with the general population (see Table 1). In Australia this is reversed. For juveniles, this pattern does not hold. For example, in China, the female-to-male ratio is only 74% in our survey portfolio, much lower than the 86% ratio in the general population. We also compared the average sum insured of in-force policies among markets and against the previous survey (see Figure 3). 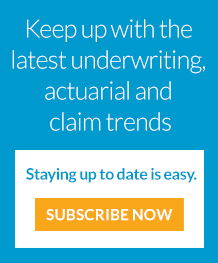 Sum insured is positively correlated to the economic status of the market. Two of the developed markets, Hong Kong and Singapore, sold much bigger policies than the three developing markets of China, Malaysia and Indonesia. The exceptionally high sums insured observed in the Australia market probably result from the low initial premiums on offer – so-called stepped premiums that are recalculated on each policy anniversary gradually rising over time. Compared with our last survey, sum insured in China has increased from USD 6,150 to USD 7,574, or 23%. For new business, the sum insured has reached USD 11,166 in 2012, about four times as it was in early 2000. Claim declinature rate varies significantly by market, ranging from 5.6% in Malaysia to 25.9% in Indonesia (see Table 2). More than a half of the claims turned down in the Indonesian market are attributed to “disease not covered”, suggesting a poor understanding of policy provisions by both insured and sales people. Figure 4 shows how the claim declinature rates have changed in our survey series. Except for Hong Kong, declinature rate in other markets is lower in the current survey than in the previous ones. The rates in Hong Kong were actually dropping, but went up again since 2007. The improvement in China is largely due to a reduction of the first year declinature rate from more than 36% for the period 2004-2008 to 26%. Another contributing factor is that in November 2009 the Chinese regulator introduced a two-year incontestability clause making it more difficult to cite non-disclosure. A breakdown of admitted claims (see Table 3) suggests that, for males, cancer is still the leading cause in most markets. However, its contribution varies significantly and is generally lower in Southeast Asian (SEA) countries. This is the result of the lower incidence of cancer and the higher risk of coronary artery disease in this area. Because of the limitation in claim coding/description provided by participating companies, we use ischaemic heart disease (IHD) to contain the three conditions related to coronary atherosclerosis, i.e. coronary artery bypass graft (CABG), heart attack and other serious coronary artery disease (OSCAD). OSCAD is covered by most policies we collected in Indonesia and is a reason for the high percentage of IHD. In Hong Kong, where OSCAD is rarely covered but the claim coding is clearer, we found that the coverage of OSCAD may double the cost of IHD compared with coverage for heart attack and CABG only. For females, the picture is different. While cancer incidence is highest in Hong Kong, it is not much lower in China and SEA countries. At the same time, the risk of IHD and stroke is much lower than for males in all markets. As a result, the proportion of cancer claims does not vary too much by market. Even in Indonesia, 75.1% claims are from this category. More than 97% claims are from the top 10 claim causes for both males and females. This suggests that a campaign featuring the number of covered diseases adds little value for customers. It is worth noting that the current portfolio is still young, with an average in-force age lower than 40. With portfolios ageing, some conditions more specific to senior ages, such as Parkinson’s or Alzheimer’s disease, may contribute more claims in the future. A further breakdown of cancer claims by site suggests very clear geographical characteristics (see Figure 5). In China, liver, gastroesophageal and lung are the leading cancer sites for males and contribute about 50% of cancer cases. This is probably the result of the high prevalence of hepatitis B infection (for liver cancer), diet and infection of high-risk type of helicobacter pylori (gastroesophageal cancer) and high smoking rate (lung cancer). In Hong Kong and SEA countries, the contribution of the above cancers, especially gastroesophageal cancer, is much smaller. Instead, colorectal cancer (rank 1) and nasopharyngeal cancer (rank 2) play a very important role. Nasopharyngeal cancer is known to be an endemic cancer commonly diagnosed in southern China and the SEA area. Decrease in incidence has been observed in the general population in the past decades. In Australia, prostate cancer is the leading cause of cancer claim, probably due to the high base risk, commonly prescribed screening and the loose claim criteria. In the past, a typical exclusion wording in Australian market might read “prostatic tumours, which are histologically described as TNM classification T1 or are of another equivalent or lesser classification, unless resulting in the surgical removal of the prostate”. Among women, breast is the most common cancer site in all the six markets. In Australia it accounts for 60% of all cancer claims in female lives. In Hong Kong, Malaysia, Singapore and Indonesia, it is slightly less dominant, but still accounts for around 50% of cancer claims. In China, the proportion is only 30% but the incidence is increasing steadily. The most significant change from the previous survey is thyroid cancer in China. It seems that the epidemic trend observed in Korea few years ago is being copied by the China market. In the current survey, 11.3% female cancer claims are from this site, an increase from 6.8% in the previous survey. To keep consistency in our survey series, the number of expected claims was calculated using the graduated death with acceleration Dread Disease incidence rates for Hong Kong, Malaysia and Singapore from our 2000-2004 survey. Then we compared the A/E ratios between survey 2008-2012 and survey 2004-2008 in the four markets where credible experience is available for both surveys (see Figure 6). The China market experienced the fastest deterioration in both genders. Male A/E increased from 118% to 125% and female A/E increased from 98% to 110%. The deterioration was mainly from the acceleration Dread Disease element while the death part remained stable. For females, rapid increase in thyroid cancer incidence is the main reason for the deterioration. Worsening experience in breast cancer and cervical cancer is also a contributor. For males, the causes of the deterioration are more diversified. Thyroid cancer, stroke and heart attack are the main drivers of the trend. In Hong Kong, while male experience was still stable, female experience deteriorated from 101% to 109%. Considering the 1.6% improvement in death part, deterioration in acceleration Dread Disease part is even more significant. Breast cancer contributed a big portion to the worsening experience. 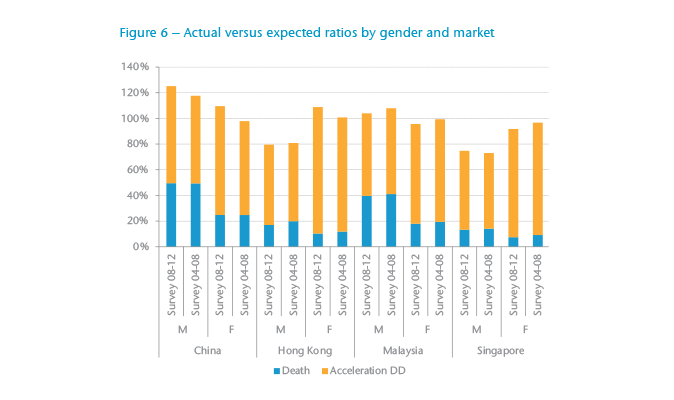 Both Malaysia and Singapore markets observed slight improvement in death part for both genders. Acceleration part also improved for both genders in Malaysia and females in Singapore. It is interesting that breast cancer incidence was observed decreasing in these two markets in our survey. However, population statistics did not show the similar trend according to the Singapore disease registry data.1 Further experience is needed to clarify. The results of the Dread Disease survey 2008-2012, and a comparison with previous surveys, reveal significant heterogeneity between the markets in terms of purchase behaviour, claim declinature rates, claim cause distribution, disease incidence and trend. China, the biggest market for Dread Disease cover, is experiencing especially fast deterioration in claim experience, for which thyroid cancer is one of the main drivers. We will explore this, and the impact of other specific cancers, in a future Risk Insights article. 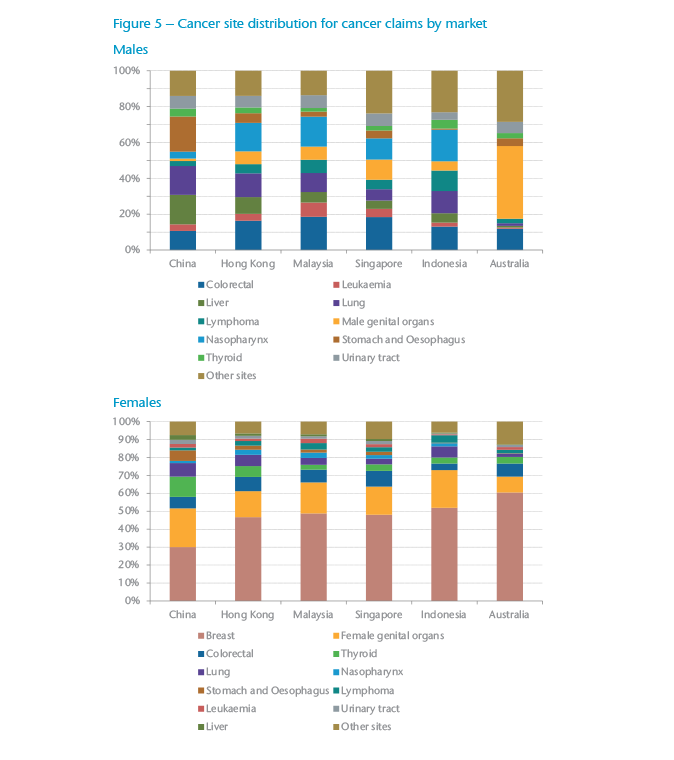 Singapore National Registry of Diseases Office, Trends in cancer incidence in Singapore, 2010-2014 interim report. Available at https://www.nrdo.gov.sg.